Having trouble with your garage door in Buford? No problem! In this post, we’ll take a look at some of the most common issues affecting garage doors, and what repair services you may need to get your door back in tip-top shape. Let’s get started. This is almost always indicative of a problem with the power source that operates the garage door. Start with the simplest troubleshooting step – make sure that the motor unit is plugged in. If it is, check the circuit breaker or fuse that controls the circuit your outlet is on. If this isn’t working, you will need to reset the circuit breaker. If your circuit breaker triggers repeatedly, it’s possible there is a short somewhere in the system – you should stop trying to fix your door yourself, and call an electrician for professional repairs. It’s also possible that the door’s motor has burned out, and will not respond to your input. If the lights and other appliances in your garage work properly, but the motor is not responding, this is a likely cause. You will need professional repairs or a replacement motor. 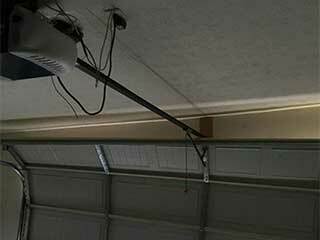 The most common cause of garage doors not opening completely is damaged rollers, or misshapen roller tracks. Rollers can be damaged by continuous use, and over time roller tracks can also become warped due to metal flexing, or accidental impacts. You can lubricate rusty rollers, and replace them yourself, or turn to a professional repair service. Roller tracks usually cannot be repaired, and will require replacement. Loud noises when using your door are usually indicative of debris or damage to the roller tracks, or the rollers themselves. Rusty and worn-out springs can also be very loud, and may require cleaning or replacement. Typically, cleaning and lubricating your springs and rollers/roller tracks will resolve this issue. Contact Garage Door Repair Buford For Professional Service! Can’t troubleshoot your garage door on your own? Garage Door Repair Buford is here to help. We offer professional repair services – from springs to rollers and motors, we do it all. Contact us now to learn more about our rates, and service availability.